Born in England, Bown was raised in Brantford, Upper Canada, the son of Dr. J. Y. Bown. He trained as a dentist, then immigrated to the midwestern United States, where he became involved in the 1862-63 Sioux uprising. Bown moved to Red River in 1863, and soon became involved with John C. Schultz, an association which lasted for nearly three decades. He first became editor of the Nor’Wester when Schultz was jailed in 1868. Bown purchased the newspaper from Schultz on 1 July 1868. It continued to advocate Canadian annexation until it was shut down by Louis Riel. Bown was forced to hide from Riel’s wrath, and stories circulated of his escape from Red River in disguise. 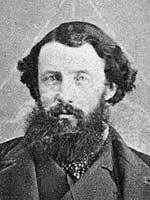 He accompanied Schultz to the United States in 1872 in an abortive plot to steal Riel’s papers. In 1873 he was appointed to the Council of the North West Territories. He continued to serve as Schultz’s factotum, including a term as private secretary while Schultz was Lieutenant-Governor of Manitoba. He was a founding member of the Manitoba Historical Society. At the end of his life, he was involved in a demeaning court case in which his sister tried unsuccessfully to prove him incompetent to manage his own affairs. He died at Battle Creek, Michigan on 11 March 1903.